For its architectural quality and its revival of tradition, the work of Mohamed Saleh Makiya stands as a prototype for Iraq and for new developments in the third world in general. Like Hassan Fathy in Egypt, Makiya analyzed Iraq’s past in his architectural work, in his role as an influential teacher, and in his scholarly publications. His ideas can be found in his writings: The Arab Village, sponsored by UNESCO and published in Cairo in 1951, and The Architecture of Baghdad, published in 1969 with the assistance of the Gulbenkian Foundation. In both books the fundamental insights that he established led to a reappraisal of the Iraqi architectural past. Educated in Liverpool England, Makiya received a degree in architecture in 1941 and a degree in civic design in 1942. He completed his studies at Kings College, Cambridge, where he received his Ph.D. in 1946, and returned to Baghdad in the same year to open an architectural office. His firm continued to have worldwide impact even after he himself left Iraq to work from his London office, which was established in 1975. It is significant that Makiya does not separate theory, professional activities, and practice, but combines all these areas, with the result that each is enhanced and enriched by the others. His architectural commissions include religious buildings, office and administration buildings, educational and residential buildings, and urban design in a universal complexity that has few rivals in his country or elsewhere. His work includes newly emerging building types, such as buildings for the handicapped, which challenge the established forms of contemporary architecture. After he started his own firm in 1946, he devoted himself to designing a significant number of religious buildings, beginning with the Khulafa Mosque in Baghdad. 1960-1965. The major task of this commission was to integrate the new mosque into the context of the old mosque and to achieve a harmony between old and new. His design followed traditional patterns and included the old minaret from the ninth century as part of the overall plan. The completed complex, nearly 1000 years apart in time, created an ensemble that changed the site. Ornament and spatial organization are in harmony with the character and tradition of the mosque. Included in the new mosque is Kufic calligraphy, which would never have been possible in a rigid modernist solution. The Kuwait State Mosque (1977-1981) is a step further in the consolidation of a building type from the past for contemporary use. At a cost of 13 million Kuwaiti dinars, 130 times the cost of the Khulafa Mosque, in Baghdad, this very large building accommodates 7000 people. 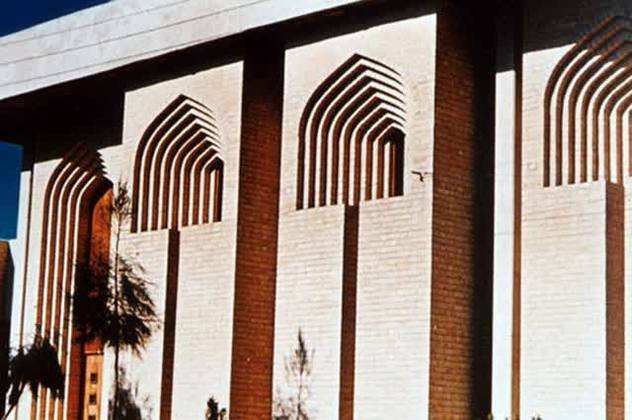 Makiya designed several additional mosques for Islamabad (1970), Bahrein (1973), and Muscat (1997), but his most important work in this category is the 1983 design for the Baghdad State Mosque. The design was part of a competition that included invited architects such as Robert Venturi, Ricardo Bofill, Rasem Badran, and Maath al-Alousi. This very ambitious project was to accommodate 30,000 worshipers and included a school a library, guest houses and residences. Makiya’s proposal created a grandiose complex in a rectangular space with a monumental minaret and a dome that was supposed to be the dominant element of the neighborhood. It was to be located in the central area of the round city of Al-Mansour. It was, for Makiya, a synthesis of earlier elements now orchestrated into a monumental ensemble. As his son Kanan Makiya interpreted the design, its “monumentality is deeply rooted in the architecture, not attached to it from the outside as a consequence of the brief, the type of client or through simple-minded bigness.” He legitimately compares the unbuilt design for the Baghdad State Mosque with the great examples of eady mosques of the region, specifically the mosques at Samarra and Ibn Tulun in Cairo, the culmination of the old tradition. The fact that a contemporary project can stand such a comparison is unique as it demonstrates the very different and yet unrecognized status of a non-Western architecture of high quality. As was stated before, the ability of an architect is manifested not by a few singular buildings but in the many problems that await contemporary solutions. Makiya is in line with a few modern architects who are engaged in a wide variety of difficult tasks. Besides his religious buildings, Makiya has designed a number of educational structures. In 1965 he worked out a plan for Baghdad University; in 1966 he designed the Theology College in Baghdad, in close proximity to the existing buildings of Baghdad University; and in the 1967 plan for Al-Kufa University he envisioned a new campus for 20,000 students in a shape that harmonizes with the old Iraqi tradition. In 1981 Makiya designed the complex of Rashid University in Iraq in collaboration with the German firm of Heinle, Wischer & Partners. And in a recent project for Al-Ain University of the United Arab Emirates, Makiya further developed his scheme, replicating and adapting the old plan of the city of Arbil for contemporary academic purposes. Since 1966, Makiya’s activities have expanded beyond the borders of his country, where he executed a large number of commercial and residential buildings that include bank buildings in Basra and Mosul (both 1966) and Kerbala and Al-Kufa (both in 1968). In open reference to old Iraqi historic building elements these banks apply motifs that relate to tradition, such as window setbacks in the Rafidain branch in Al-Kufa and the blue tile exterior walls on the Rafidain branch in Kerbala. The Al-Kufa building was heavily damaged in the Gulf War, and the one in Kerbala was completely demolished. 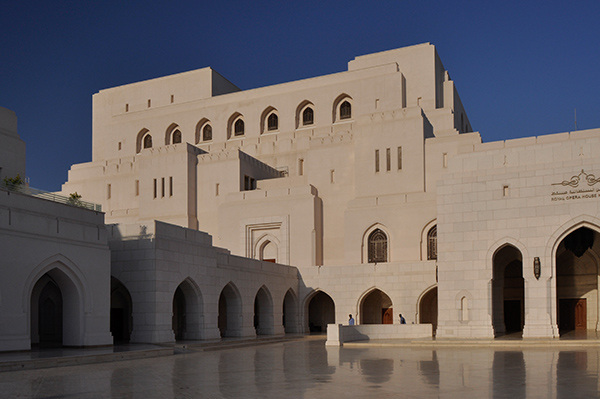 In expanding his work to Bahrein and Oman, Makiya was able to realize a large number of buildings; among them are the Sheikh Mubarek Building in Bahrein (1973), the Entrance Arch and the Center for the Handicapped of Isa Town in Bahrein (1973), the International Hilton Hotel, a garage and houses in Dubai (1974), the Al-Andalous housing complex in Doha, Qatar (1983), and the Police Officers Club interior design in Abu Dhabi (1982-1986).